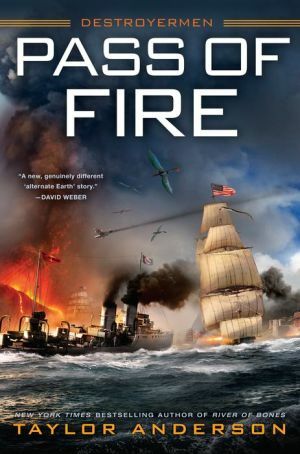 After being transported to a strange alternate Earth, Matt Reddy and the crew of the USS Walker have learned desperate times call for desperate measures, in the return to the New York Times bestselling Destroyermen series. Time is running out for the Grand Human and Lemurian Alliance. The longer they take to prepare for their confrontations with the reptilian Grik, the Holy Dominion, and the League of Tripoli, the stronger their enemies become. Ready or not, they have to move--or the price in blood will break them. Matt Reddy and his battered old destroyer USS Walker lead the greatest army the humans and their Lemurian allies have ever assembled up the Zambezi toward the ancient Grik capital city. Standing against them is the largest, most dangerous force of Grik yet gathered. On the far side of the world, General Shinya and his Army of the Sisters are finally prepared for their long-expected assault on the mysterious El Paso del Fuego. Not only is the dreaded Dominion ready and waiting for them; they've formed closer, more sinister ties with the fascist League of Tripoli. Everything is on the line in both complex, grueling campaigns, and the Grand Alliance is stretched to its breaking point. Victory is the only option, whatever the cost, because there can be no second chances.